The Internet of Things (IoT) connects your devices together through the internet, where data can be shared and exchanged. 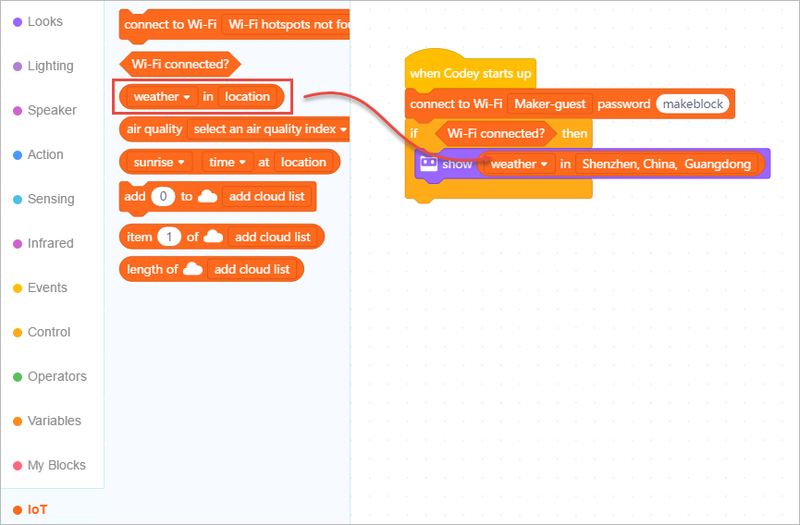 With built-in Wi-Fi, Codey Rcoky can connect to the internet to realize its IoT functionality, such as obtaining data of the weather. 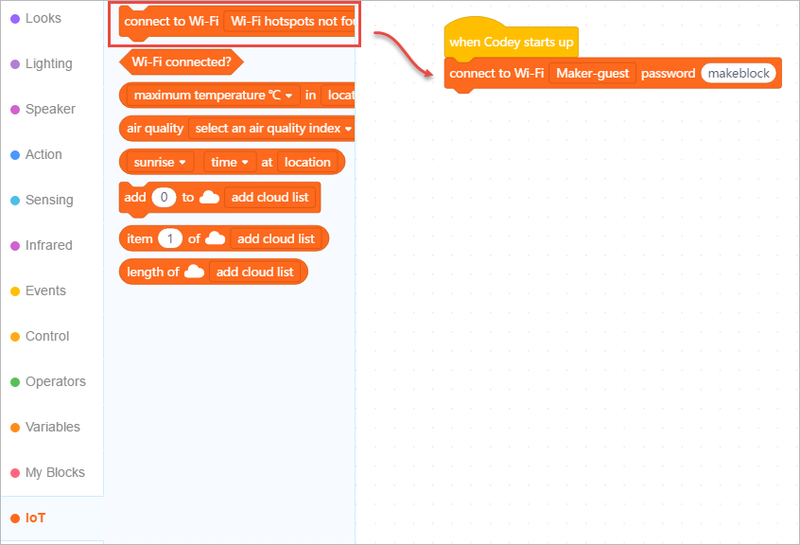 Use IoT blocks to explore cutting-edge stuff with Codey Rocky. 2. 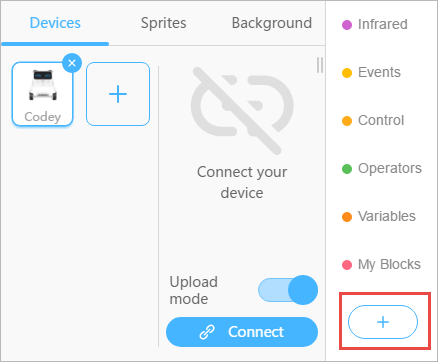 From the pop-up Extension Center page, click "+" to add IoT blocks. 3. Go back to Edit Page, you can find IoT category added to the block palette. Let&apos;s try out the new IoT blocks. We will make Codey report weather. 1. Drag a when Codey starts up block from the Events category to the Scripts area. 2. Drag a connect to Wi-Fi () password () block to connect Codey to your Wi-Fi. Type in the Wi-Fi name and password. 3. Drag a if () then () block from the Control category. Add a Wi-Fi connected? block from the IoT category to the condition. 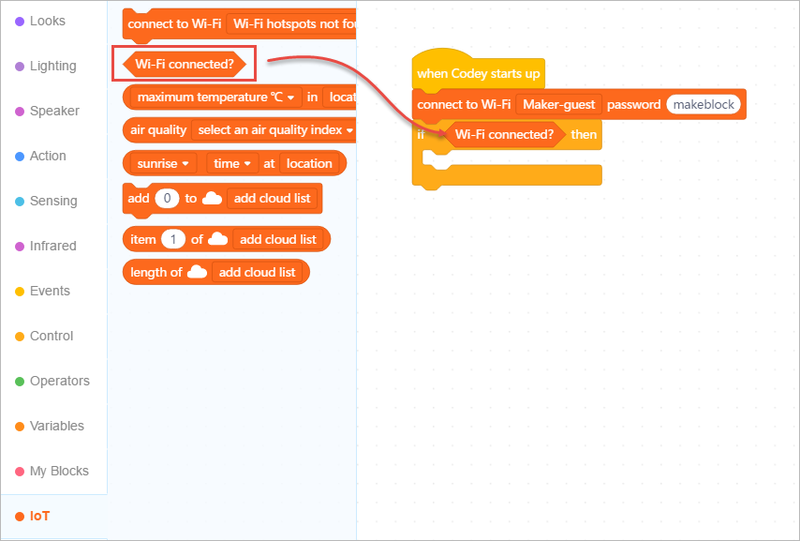 Codey Rocky needs to join a Wi-Fi network to obtain weather data. 4. Drag a show () block from the Looks category, and wrap it up with the if () then () block. 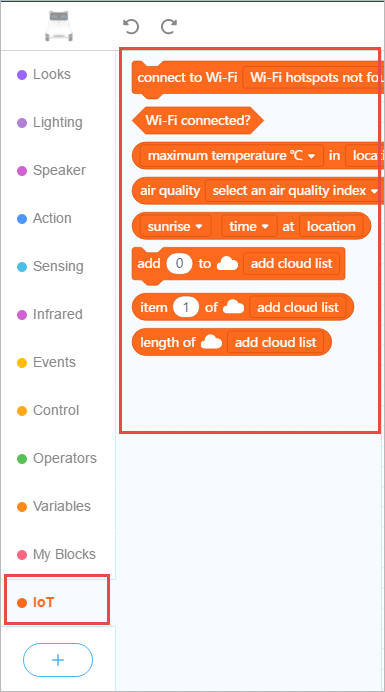 We want Codey to show weather data, so we need to add a weather in () block from the IoT category. Type in a city name. In this example, we type in "Shenzhen" and choose the drop-down list. 5. 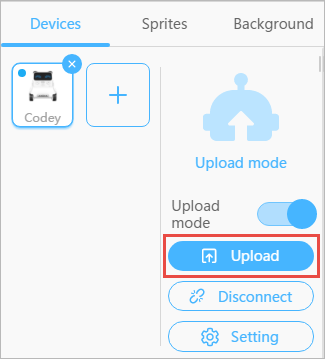 Click "Upload" to upload the program to Codey. 6. Check Codey&apos;s screen to see weather report.